The does will be having their fawns soon, predators will be on the prowl and the fawns spots will help to hide the fawns from them. If you like deer hunting big bucks, you know that not only has spring training begun for the boys of summer, and Nascar is at full throttle, the fishing is fixing to get real good, turkey season is starting. The first two days are critical to the survival of the fawn. After the two days, there chances of survival are much better. Usually whitetail fawns weigh between four and seven pounds when born. The doe will determine a safe location for the fawn and it will stay in that surrounding area for the first three to four weeks. The doe will come to the location so the fawn can nurse. The only time the doe comes around, is to nurse the fawn, as not to give away it’s location. The fawn is odorless for the first few days. The spots help keep the fawn camouflaged. If trouble comes near its instincts will tell it to lie flat and motionless. About two weeks after birth, the fawn will start to eat solids. After about a month it will be able to travel around with its mother. It will loose its spots around twelve weeks, and start looking like a mature deer. They will remain with their mother for about a year sometimes longer. The doe will teach the fawn all about survival . During June and July the fawns will grow quickly. Fawns are every playful and fun to watch. I would like to take my camcorder and record some fawns playing, it is downright funny sometimes. 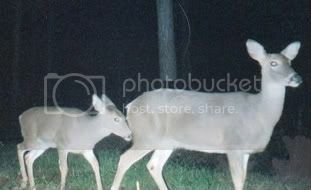 One time when I was deer hunting I watched two older fawns chase each other around a cornfield. It was a sight to behold. One of them would be feeding and the other one would playfully dance up to it, and when it would get close, the other one would chase it about 100 miles an hour around the corn field. They did that over and over until it got dark. So when I hear that bat hit the ball, or hear gentlemen start your engines, or catch a big fish, or hear that turkey gobble I will smile and think about that newborn fawn and what a wonderful spring day it is. Tagged fawns. Bookmark the permalink.